Eddie the Eagle co-stars Hugh Jackman and Taron Egerton teamed up to take on The Tonight Show host Jimmy Fallon and announcer Steve Higgins in a super competitive game of Catchphrase. The object of the game is to provide clues to your partner so that they can guess what’s written on a card as quickly as possible. The round continues until the buzzer goes off and the team left holding the timer is the loser. The Jackman / Egerton team and the Fallon/Higgins team battled it out to the tie-breaking third round. 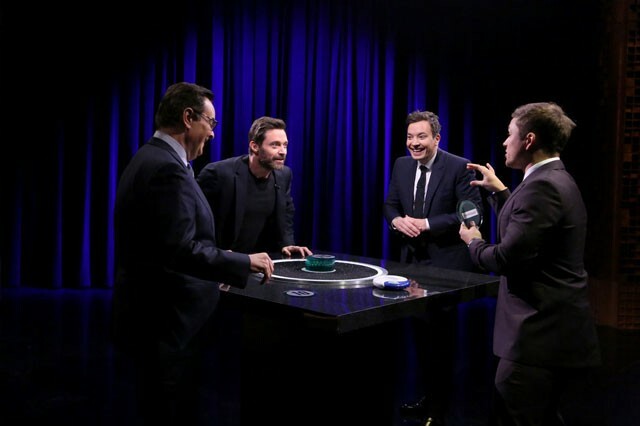 Among the more memorable descriptions offered up during the competition were Fallon’s impression of Nicolas Cage and Hugh Jackman trying desperately to get Egerton to say ‘Go with the Flow.’ There was a lot of arm-waving and flapping around as Jackman attempted to describe the word flow. Eddie the Eagle is based on the inspirational true story of British ski jumper Michael Edwards. The comedy/drama opens in theaters on February 26, 2016. The Plot: Eddie the Eagle is a feel-good story about Michael “Eddie” Edwards (Taron Egerton), an unlikely but courageous British ski-jumper who never stopped believing in himself – even as an entire nation was counting him out. With the help of a rebellious and charismatic coach (played by Hugh Jackman), Eddie takes on the establishment and wins the hearts of sports fans around the world by making an improbable and historic showing at the 1988 Calgary Winter Olympics.